All transactions are safe and secure with a reliable history in online purchasing behind each of our associates. 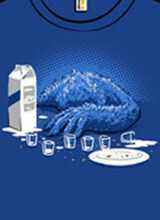 Buy the Cookie Monster Binge t-shirt to own Sesame Street clothing and merchandise. Growing up on the street can make you more susceptible to various addictions, as this bestselling Sesame Street Cookie Monster shirt demonstrates. The design features the cookie loving monster passed out after a shameless cookie binge. We've all had similar moments of weakness where we lose our self control and splurge, whether it be with cookies, candy bars or ice cream. Recognize the legendary monster by pairing this with a classic Bert and Ernie Sesame Street t-shirt for you and your best friend. In addition to the Cookie Monster Binge tee above, browse the Sesame Street Clothing Gallery for more apparel like men's and women's clothes, kids shirts or hoodies.